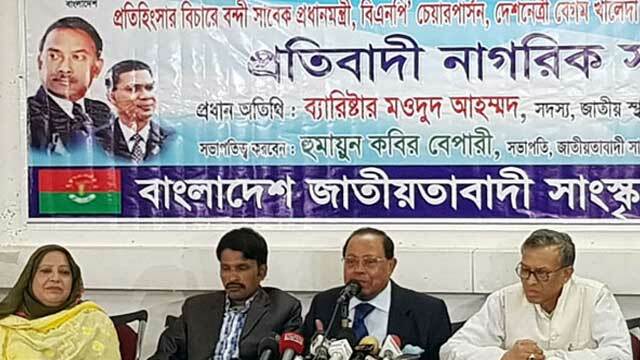 Dhaka, Feb 16 (Just News): Bangladesh Nationalist Party senior leader Moudud Ahmed on Friday alleged that the government is buying time as part of its trick to give a certified copy of the verdict against their party chairperson Begum Khaleda Zia in a graft case only to prolong her stay in jail. Speaking at a discussion in the capital, Moudud warned that people will give a befitting reply through ballots to the government’s ‘vengeful attitude’ towards Khaleda Zia. ‘The verdict was pronounced on February 8, but we still didn’t get a certified copy of it. They (govt) are resorting ploy to keep Khaleda in jail as long as they can,’ the BNP leader said. The discussion was arranged by Jatiyatabadi Sangskritik Dal at the Jatiya Press Club protesting at the jailing of Khaleda in a graft case. Moudud, a BNP standing committee member, said the government’s popularity is on the wane for showing a vengeful attitude towards Khaleda Zia. He said as soon as they get the certified copy of the verdict they will move the apex court to file an appeal against the verdict and seek bail for her. The former law minister hoped that the court will grant bail to Khaleda. He said people -- even many Awami League supporters - did not like the way Khaleda was sent to jail and the government is treating with her. ‘We’ll carry out the movement and create an atmosphere to force the government to hold the next national election under a non-party neutral administration. Only Awami League will face the dire consequences in that polls,’ he added.